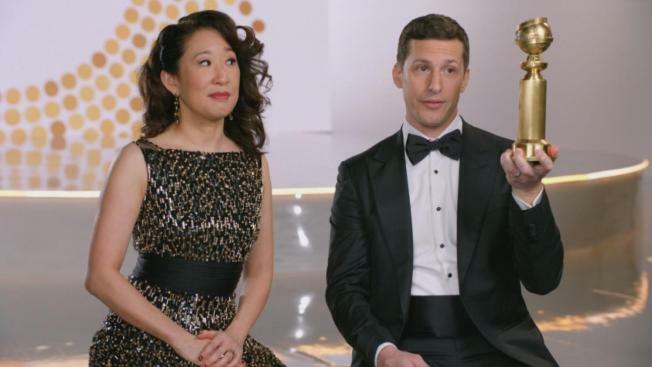 Actress Sandra Oh wants to bring a lighter tone to the Golden Globes after last year's awards show took a much more serious approach centered on the #MeToo movement. Oh said Thursday that she and fellow host Andy Samberg will provide a "moment of joy" at the 76th annual Golden Globe Awards in Beverly Hills on Sunday night. She and Samberg were first paired as award presenters during a comical set at the Emmys last year when Oh ripped up the winner's envelope, referencing the 2017 Oscars "La La Land" slip-up before the duo pieced together the card and announced the actual winner. "I know when Andy and I were talking about the feeling that I really want to bring, and really focus on, is just to have a moment of joy," said Oh, who is favored to win a Golden Globe award for best actress for her "Killing Eve" role. "Honestly, with who is going to be in that audience, the nominees this year, it excites me so tremendously ... mostly because of the diversity in that room." Hollywood Foreign Press Association President Meher Tatna called last year's ceremony an important moment in the television and film industry as many dressed in black in solidarity with the victims of sexual harassment. But she said Sunday's awards won't be as politically charged. 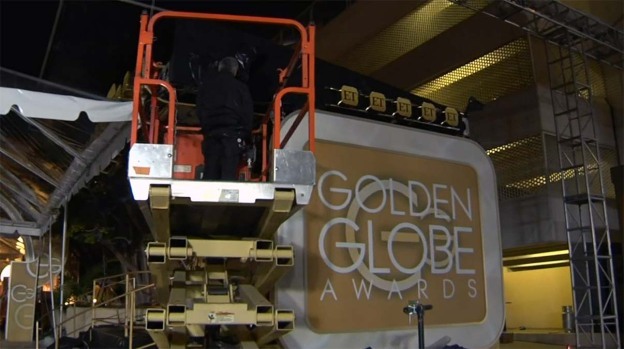 Lighting, signs and the red carpet are set up at Beverly Hills' Beverly Hilton hotel in the days ahead of the 2019 Golden Globes awards show. Tatna said she hopes the Golden Globes can return to its roots as the "party of the year" by giving attendees an opportunity to "escape reality." The awards show is known for being a place of celebration, serving a bevy of champagne. "I think everybody is tired of politics and maybe for one night we can have fun and not worry about the state of the world," Tatna said. She added that the show will use its platform to honor Carol Burnett and Jeff Bridges with lifetime achievement awards. Burnett, 85, a five-time Globes winner, will receive the inaugural Carol Burnett Award, which focuses on television. Bridges, 69, who won a Globe in 2010, will be honored with the Cecil B. DeMille Award, an accolade for film.